The holiday season means that parties are on the way! Family gatherings, potluck lunches at work, Christmas parties…too many celebrations to mention. You know what that means, right? Get ready to eat loads of delicious food! From homemade baking to family favourite recipes, the holiday season is known for all the tasty food. Are you planning a party? 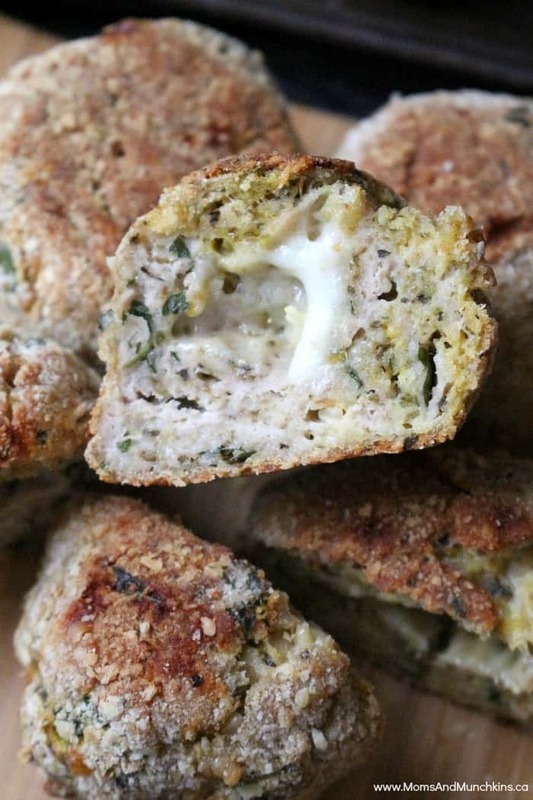 You & your guests are sure to love these Cheese Stuffed Chicken Meatballs. They are packed full of flavour & they make a great appetizer for parties. I found this yummy recipe on the Chicken.ca site. There are so many great recipes there that would be perfect for holiday parties. These meatballs are a great finger food for kids too – an appetizer that all ages will love! I had to use dried basil & oregano because I couldn’t find any fresh herbs at the store but they were still really yummy. They freeze really well too. This recipe makes 48 small (bite-sized) meatballs or 20 medium size. In large bowl, combine ground chicken, eggs,1/2 cup of bread crumbs, Romano cheese, parsley, basil, oregano, garlic and pepper. Form 48 meatballs from this mixture. Insert one of the small cubes of Provolone cheese into each meatball and then reshape ground chicken to cover cheese. Grease baking sheet with the olive oil. Place remaining bread crumbs in bowl. 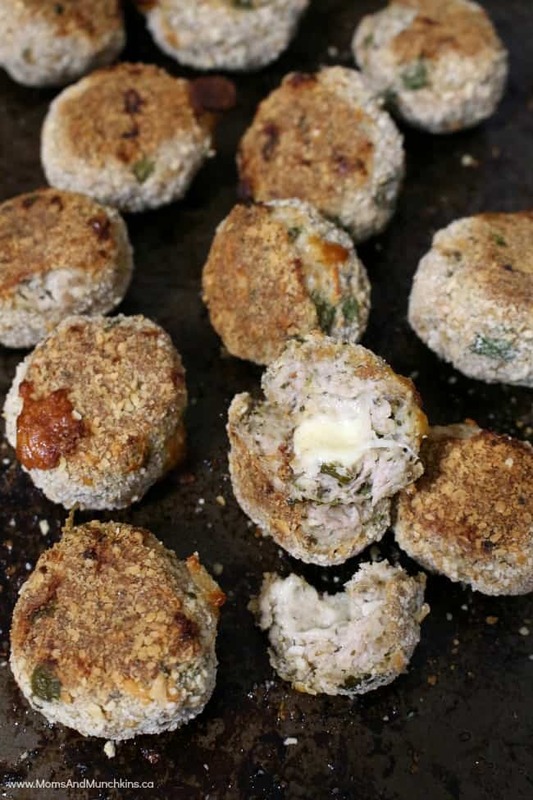 Coat each meatball with bread crumbs and place on baking sheet. Bake in oven until the meatballs are fully cooked, about 40 minutes. Meatballs should reach an internal temperature of 165°F. 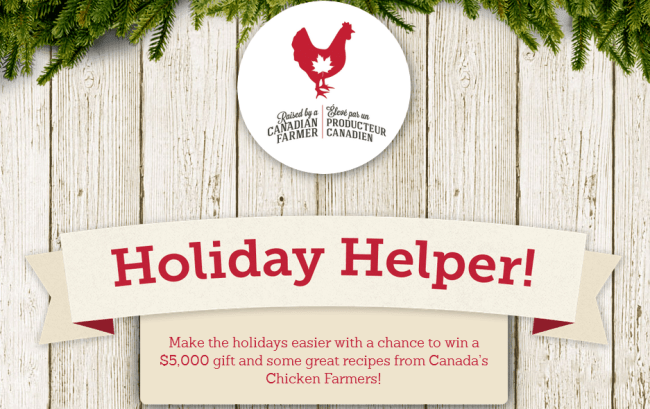 Raised by a Canadian Farmer wants to help make the holidays easier for you with a chance to win $5000! The contest ends December 15, 2015 at 11:59pm EST so get those entries in today! 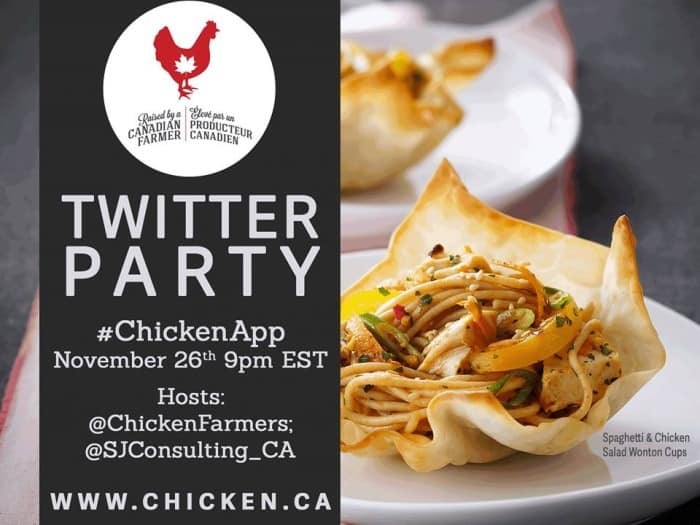 Join us on Thursday, November 26th at 9pm EST for the #ChickenApp Twitter Party! We’ll be talking about delicious holiday appetizers and how the FREE Shopping with Chicken App can help you stay organized. With the free app, you can search tasty recipes, save & update your list in realtime, share your list on multiple devices & more! RSVP here for the party to be eligible to win! Prizing is open to Canadians 18+, excluding Quebec. Official rules & regulations can be found here. These look so good! My family would love this. Thanks for sharing.